simultaneously protect it from ultraviolet radiation. I believe that there is an even more adapted insect with antifreeze in Tibet. This is not the one, but very interesting. Active down to -16 degC. I don't expect to find animated multicellular life on Mars, but maybe I might be wrong, but obviously down to -16 degC is a possibility for active microbes. I am not sure that any life will ever adapt to Martian UV, perhaps most likely not even lichen. However, Antarctic Lichen is active below freezing temperatures. Able to hydrate from snow, they don't even require liquid water. The results suggest that the major activity period of the lichens was at the time of final disappearance of the snow and lasted about 10-14 days. The activation of lichens under snow by high air humidity appeared to be very variable and species specific. Xanthoria mawsonii was activated at temperatures below -10 degrees C through absorption of water from high air humidity. PDF | Are lichens active under snow in Continental Antarctica? Oecologia. Available from: https://www.researchgate.net/publicatio … _Oecologia [accessed Jul 09 2018]. The sub glacial lake that feeds blood falls is 3 times as salty as the ocean, and has been isolated for a million years, but has life. Enrichment cultures of melt-water from Lake Vida 15.9 m ice yielded five pure cultures of aerobic, heterotrophic bacteria. Of these, one strain grew at −8°C and the four others at −4°C. All isolates were either halotolerant or halophilic, with two strains capable of growth at 15% NaCl. I think that there are colder ones with life. These lakes seem to generate Nitrous Oxide and Hydrogen by a reaction of the brine with the lake bottom soil. Perhaps creating food for the micro-organisms. Hyper saline lakes in the Arctic. Not known if they contain life -10 degC. I entered the above to note that in fact most of the Martian duricrust may encounter temperatures and pressures sufficient for briny water to exist. There are several conditions on Mars that are considered lethal to life and particularly human life, but in concert, I believe that they provide a loophole for life to exist in places on Mars. 1) Day Night temperature cycles, particularly near the equator. This is associated with conditions of high humidity at night at times. 2) Carbon Monoxide in the atmosphere, considered a poison for food for some microbes. 6) Attenuated sunlight .43% of Earth's? Anyway to spare time I will get to it. A particular rock on the surface of Mars may cycle in temperature due to sunny days and frigid nights. A correctly sized and shaped stone should soak up the heat and on it's underside, be warm enough on occasion for above freezing temperatures of brines. Perhaps warm enough for life. The question of water might be solved by the brine freezing at night. The brine closest to the stone bottom should get the coldest fastest, and so be the most likely to freeze. It should squirt out some of the brine with excess salt. Upon warming the next day, the underside of the stone may have a film of less salty brine ice which may be reduced in salt enough to be suitable for microbes to drink, but salty enough to melt. The brine which was ejected downward should be cold and salty and potentially absorb vapor moisture from the soil, particularly as the soil which absorbed RH% from the night air warms up. As that cold salty brine warms up it might reconnect to the underside of the rock, and the less salty layer, and they might mix. But ideally the microbes had a chance to get a drink before being exposed to hypersaline brine. As for the Perchlorates, they might serve as an oxidizer for such life, if they can buffer the oxidation by absorbing Carbon Monoxide from the soil which presumably would be permeated by it from the atmosphere of Mars. A microbe with something like Hemoglobin, might absorb lots of CO, and so then be able to balance the bleaching effects of Perchlorate. Maybe. YOUR STUPID SITE LOGGED ME OUT AND I LOST A WHOLE LOT OF MATERIALS! I HATE THIS OBSTRUCTIVE BEHAVIOR. It is late. I did have a very fine method(s), but it is late. I will return. Lets hope obstruction will not be the rule of that day as well. Let's not forgot there are ice worms on Earth. Let's not forget all the extremophile organisms on Earth that can cope with many aspects of the Mars environment. Let's not forget there are organisms on Earth that can metabolise iron oxide to create oxygen. Let's not forget that there are plants on Earth that can generate heat chemically overnight. It seems quite possible that various life forms have adapted to Mars conditions and will be found there today, living in caves, in subterranean water, in ice...We know there are on Earth plants that can wait decades for their seeds to germinate...maybe some plants on Mars wait hundreds or thousands of years. For me, this is one of the key reasons to go to Mars, to see if there is any life there. I am interested in the possibility of life. However, for Mars, the CO is not consumed, and no apparent life exists in surface photos. For Venus, the CO is consumed by some process, either living or abiotic. There appear to be swarms of bacterial sized objects in the atmosphere of Venus. My hunch is that all three, Venus, Earth, and Mars were likely living at some point in history. Probably periodically swapping life. Viruses do horizontal gene swapping, so if the life had RNA or DNA, chances are over time the distinctions would be blurred. If life is on Mars, it seems it should be sub-surface for the most part, and quite small. I really think that probes to Venus are the ticket. The objects in the clouds either are or are not life. It should be relatively easy to get a notion on that. I think their method of suspension in the atmosphere would be a combination of light weight, perhaps even lighter than air construction, perhaps ciliated animation, gliding on updrafts, and perhaps electrostatic levitation. 1) Build a greenhouse with a hydrostatic fill. The air in the greenhouse can be quite low pressure. 2) The hydrostatic fill might be fresh water, with a modulated layer of ice over it. The greenhouse however would also hold enough pressure that the ice could be periodically melted for refreshing. The air pressure being quite low, the amount of bubbles in the ice which would tend to make it opaque would be low. This would then facilitate a clear ice window most of the time. 3) The waters within are preferred to be sterile. Therefore I would not make any effort to block UV in the glass of the greenhouse. Depending on purpose, we may or may not choose to make an effort to make the ice layer UV blocking. In this case I will say no, don't block the UV. Other methods to render the water sterile would be to degas the water of organic chemistry molecules such as CO2 and O2. Biological poisons could also be considered. The purpose here is to allow sunlight to penetrate as deep into the water as possible. 4) The UV penetrating the glass and ice, will serve to help warm up the greenhouse, and help to keep the water bath sterile of life. 5) Next include subdomains of containerized terrariums, which will have individual UV protection, and will be able to maintain a desired differential pressure from the water column. 6) Typically, Automation and Human divers in protective gear can move these terrariums from the Planting/Harvesting facility to deployment in the "Greenhouse" water column. 7) In some cases, the terrariums would stay in location, if the crop being raised could be pumped out to harvest. Duckweed and Spirulina come to mind for this process. 8) Therefore the terrariums being capable of individual differential pressure, and typically being better at holding compressive force on the exterior, rather than tensile strength required to hold the contents of the interior compressed relative to the outside, it would be preferred to have the terrariums deeper in the water column. This is why I want the water and ice of the common greenhouse enclosure to be sterile and therefore as transparent as possible. 9) Still, if not enough light enters a terrarium, it should be possible to include reflectors on the exterior of the terrarium to reflect extra light into a terrarium. I have mentioned Duck Weed. This would be a case where a terrarium might have a air pocket relatively thin for the weeds to float on. I have mentioned Spirulina. In this case no air pocket is required, so buoyancy issues are not that much of a problem. Another case I can think of is to partner Potato and Mushroom in one terrarium. This would be air filled, and Ballast will likely be required. The Potato would provide Oxygen, the Mushroom would provide CO2. *The entire method should provide a frost free situation in the cold water under the ice. The daytime sunlight should elevate temperatures in the terrariums. This design is produced with the notion that the problems of building transparent structures with sufficient physical strength can be accomplished on Mars. It also shows that I understand that in many cases we can build agricultural facilities in large part with water, Ice and regolith. The regolith can be the floor and "Berm" walls of the basin that would be constructed. Therefore we avoid using sophisticated and expensive structure to build the bottom and sides of the structure (For the most part). A possible model for how Mars organisms might survive the harsh conditions on the Red Planet? That is really an interesting thing. Honestly I could spew out and endless amount of wording in several directions, but I will try to limit myself. If life is or was on Mars, when did it start? Scientists have found evidence on Mars that supports the idea our Solar System went through a tumultuous period. The findings, led by the Southwest Research Institute (SwRI) in Texas and the University of Arizona, were published in Nature. The idea of our Solar System going through a late heavy bombardment (LHB) 4.1 to 3.8 billion years ago is a bit controversial. Basically, we think that something caused comets and asteroids in the outer Solar System to swing inwards, maybe a passing star or planet, impacting many of the planets and moons and possibly bringing life and water to Earth. We can see evidence for this on the Moon. Samples collected by the Apollo missions found that most of the craters on the Moon originated from this period. Other bodies seem to have craters of a similar age. In this latest study, the scientists dated impacts on Mars. In particular they looked at its largest basin, Borealis, which is 10,000 kilometers (6,000 miles) wide and covers most of the planet’s northern hemisphere. By comparing it to the youngest large basins on Mars – Hellas, Isidis, Argyre, and Utopia (which is now buried) – they found that it was 4.5 billion years old, almost as old as Mars itself. This then appears to have been followed by a lull for about 400 million years, which the researchers call the “doldrums”, before another period of bombardment from 4.1 to 3.8 billion years ago. The formation of these basins require two groups of asteroids to hit Mars, with the first being the result of the planets forming, and the second possibly the LHB. “The new results reveal that Mars’ impact history closely parallels the bombardment histories we’ve inferred for the Moon, the asteroid belt, and the planet Mercury,” lead author William Bottke from the SwRI said in a statement. That won’t entirely put the debate over the LHB to rest. But it does provide a bit more evidence supporting the idea. So to me this seems to indicate that the primary period of habitability for Mars would have been in the 'doldrums'. I also think that the LHB did happen in the manner indicated, vast changes were induced on Mars in the time period 4.1 to 3.8 billion years ago. I choose to presume that Mars had a Methane content during the doldrums and that it had Tholens generated which would have protected from UV. However it would have tended to be cold, the sun being quite dimmer then. But reading I have done indicates that Tholens would have protected Ammonia in the atmosphere, so some significant greenhouse effect would have occurred. I do think that generally it was a cold planet, with ice covered salty lakes and seas where stratification could allow for warm water on the bottoms. I could be wrong, but I tend to think that for the most part rivers and streams that ran would have been of ice water, and in some cases might have run under glaciers. There would have been considerably greater geothermal heat to assist in such under glacier, under ice cap rivers. Even Antarctica has a system of lakes and rivers under it's ice. Warmer periods??? OK, if the evidence found says so. So, I think everyone will agree that there was at least one genesis of life somewhere sometime. I might argue that it may have happened long ago around another star. Perhaps life came to our solar system when a orphan planemo ejected from a solar system with life embedded in the gas and dust cloud that formed the star nursery that our solar system emerged from. And the germs spread with panspermia from impactors. Or the genesis was in our solar system. I have seen it indicated that panspermia could not occur between the Earth and Europa for instance, the distance being too big. Still, I bet during the LHB it could have. And I am willing to bet or second the motion that many objects were habitable in the early solar system, as having recently formed, and having an isotope of aluminum, which would have generated heat for them. Even now, I think that other small moons than Enceladus might have life, such as your fungi, in the upper layers of the rocky cores, even if above them is only briny ice. All it would take is fractured rock and a method for the moisture to migrate into the fractures. Somehow somewhere in our solar system one world originally had life. Maybe Earth, maybe not. Multiple genesis from mud in out solar system? Well, I have just seen articles that say we are likely alone in the visible universe. (How would they know???). Anyway if it is that easy, we will soon find evidence of that, as very alien life on other worlds in our solar system. I think it is unlikely. The events that created the large impact basins, Borealis or the LHB, most likely would be so severe to render the planet sterile. However the ejected material should have had the ability to reseed the planet with life later, if it could hold on in Mars or Solar orbiting ejecta. So to shorten this, I think the LHB if it was real would have been an excellent time to move life around in the solar system, by panspermia. So, Mars could have had life before the LHB. Mars apparently had life in it's atmosphere before the LHB, about 4 Billion years ago. Hmmm.... Well there could be timing errors there, but it is suspicious. So then did the LHB end that, and produce many of the river valleys that we see??? Or did later impacts form a steam atmosphere that then condensed into torrential rivers? If Mars was the original seat of Photosynthesis (And I am not saying it was or was not), then why did it take so long for the Earth to then, develop an Oxygen atmosphere? 1.5 Billion years later? My own theory is that smaller planets age faster, and that also Lacking a magnetic field and being closer to the sun ages a planet. If each planet had an atmosphere like Titan originally, Venus, Earth, and Mars, I would then define the aging process as how Methane and Ammonia become absent from the atmospheres. In the case of Mars, and Oxygen atmosphere might have occurred due to Photolysis of the molecules and the drifting away of Hydrogen from the planet, carried away by the very active solar wind of the time. For the planets when they were cold, also we can suppose that perhaps Tholens formed might accumulate at the bottoms of anoxic bodies of water, and into major ice fields. So it is a toss up as to which planet aged to Oxygen first Mars or Venus? Probably Mars I think. Did Venus ever have and Oxygen atmosphere? Don't know. So, another question is does photosynthesis that creates Oxygen occur before or after Oxygen in the atmosphere? I guess almost anyone thinks that plants create the Oxygen, but I think that if they did, and there were still sufficient Methane, Ammonia, and Tholins around, the Oxygen would be created in vane. I think those gasses must be exhausted before an Oxygen atmosphere can exist. Is it possible that Photosynthesis originated on Mars, and then was transferred to Earth during the LHB? Who knows. But however photosynthesis came to be on Earth, if it was oxidative, it would not generate an Oxygen atmosphere until all the Methane, Ammonia and Tholins in the atmosphere were used up (Or other Carbon fuel type compounds). Sufficient Carbon being buried, and sufficient Hydrogen being similarly buried as organic materials, or the Hydrogen somehow drifting from the Earth. So I get a suspicion that Mars was somewhat wrecked by the LHB. (If it occurred). Earth may or may not have gotten life from Mars before during or after that. So, your fungus Louis.... Yes it seems like it might have re-established on Mars after things would quiet down. My reservation is that with the orbital tilt and perhaps the Planet being wrecked by the LHB (If it occurred). Large parts of the atmosphere may have been ejected by the impacts, but torrential rain to occur as well. Then a freezing. A question is how was any water retained, if it was that violent? Still the water is there. But however the atmosphere and subsurface of Mars became as it is, I see two extremes. One life giving, and one death dealing I think. Due to the presumed variable tilt, we could have a world where glaciers and ice caps form on the equator, and sunlight very likely can make melt water, or a world were almost all water ice is at the frigid poles and the equator is severely arid. In the case of glaciers at the equator, I expect all of the CO2 to be evaporated, and so the atmosphere perhaps twice as dense as now, and temporary streams possible. Daily ice and snow melts at the equator, perhaps aquifers charged. In the case of glaciers at the poles where the axis is not tilted at all, I expect almost all of the CO2 to also be condensed as ice at the Poles, and the atmospheric pressure to be minimal, no chance of liquid water at all anywhere except in aquifers. So it seems that if this were true, any life adapted to the surface would experience extinction events when the poles were not tilted very much at all. So, your fungi may be found in deep aquifers, if they are not too salty, and if they exist at all. Because of what I think may be true, I would look for evidence of artesian wells in the Mariner Rift Valley. Probably the permafrost is too thick for them now, and the aquifers are relatively at equilibrium as far as pressure to puncture the permafrost with an outflow, but perhaps during glaciation of the equator, and somewhat after, they may have existed. There you might find evidence of your fungi. But it is speculation, and perhaps easily not true. It is what I would look for if I had the eyes to look for it. Picking up on one point. Why do some people say we are alone in the universe. I think there are a number of connected arguments. Firstly I believe our star is quite a young ones as these things go, so other solar systems would have got started much earlier, maybe billions of years earlier. They would have had a head start on life on Earth. Given the techical progress we have made in just three hundred years, moving from a predominantly agricultural to an industrial economy, and the paths towards further technical achievement we can see in energy, rockets, materials and so on, it is reasonable to assume that any star system where life got going billions of years ahead of us and became multicellular would by now have become an interstellar species and quite possibly an intergalactic one - whether in their own right or through robotic extension. So the question arises, well where are they? Well either they are here or they are not. Even on Earth advanced societies now take an ethical position that they should not interfere with and thus destroy more primitive societies. Where a primitive tribe is found, we tend to keep our distance and try not to make our presence felt. It is of course quite possible that this is the position taken by advanced aliens towards us. Alternatively, lots of the UFO reports are true and they are here. And if you are a conspiracist, then our governments know they are here - they just haven't got round to telling us. The UFO observations over the US Navy group released last year would tend to back that up. Maybe the chances of getting life started are much, much thinner than we thought. Or maybe it's much harder to move from unicellular to multicellular life. Or maybe it's extremely difficult to move from multicellular to fully conscious multicellular life. Maybe on Earth there were a sequence of unlikely events that allowed humans to develop. I have read that our original ancestor hominid population groups survived some v. bad times and often must have been down to a few hundred. Somehow we passed through the "bottleneck" of evolution to become a highly adaptive, creative and intelligent species. But there was no guarantee. Had conditions been slightly different, there would be no rockets and no Shakespeare. Watching video of this year's Mars Society convention. A lot of talk of potential for life in subsurface briny water. One presenter claimed supercooled brine could remain liquid to 140°K. He didn't convert that to Celsius, but a simple converter says -133.15°C. That's the extreme, and that's if you accept supercooled liquid. Carol Stoker said perchlorates are food for certain types of single cell organisms. All this reminds me of an episode on Star Trek TNG: episode "Home Soil". 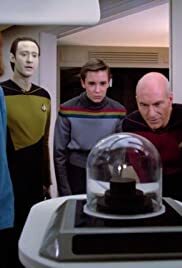 Picard: "We will send you home to your wet sand." I still see a very serious misunderstanding of what the triple point of the water phase diagram really means in the real world. It says 6.1 mbar at 0 C. That 6.1 mbar is the equlibrium vapor pressure of water at 0 C. The vapor pressure of water that datum indicates is the PARTIAL PRESSURE of water vapor in whatever atmosphere we are talking about. It IS NOT the atmospheric pressure itself! For those that disbelieve, consult a thermodynamics text to see what the variable definitions really are. You will be surprised. At Martian atmosphere pressures, in essentially all-CO2 gas composition, the max equilibrium water vapor partial pressure is far below local atmospheric pressures, be they 6 or even 10 mbar. If the local atmospheric pressure is less than 6.1 mbar at condensed-phase temperature 0 C, there will be violent boiling, leading to evaporation of all liquid or solid water on very short timescales. If the local atmospheric pressure is near but above 6.1 mbar at a condensed-phase temperatures of 0 C, there will not be boiling, but there will still be fairly rapid evaporation, on a timescale of minutes to hours. Ice is NOT long term stable at such conditions. The lower the condensed-phase temperature, the longer evaporation takes, but it WILL evaporate. For ice or liquid water to be "long term" stable (meaning hours to years timescale), the max vapor pressure of water vapor in the local atmosphere (a partial pressure) must exceed 6.1 mbar, for condensed-phase temperatures of 0 C, lower if colder than 0 C, and higher if greater than 0C. You CANNOT violate that! There are over 3 centuries of classical thermodynamics verification to tell you just how wrong you are to contend otherwise. Ice under regolith cover is sort-of-stable long term. There is a loss rate, but it is very, very slow. There is a pressure increase exerted by the weight of the regolith cover, but the real effect is its porosity. The frictional resistance of water vapor percolating through that porosity is actually quite high, leading to a quite significant pressure drop across the regolith layer. That greatly increases the vapor pressure in contact with the buried ice, to values far above the vapor pressure in the atmosphere outside the regolith cover, where max humidity physics greatly limits the water vapor pressure. Enough cover, and the vapor pressure at the buried ice is high enough to limit ice evaporation to extremely low values at the solid phase ice temperature. This same mechanism is why there is long-term stable buried ice inside comets, when the weight of the overburden is negligible. The buried ice temperature is high enough to increase evaporation when close to the sun, and too cold for evaporation far from the sun. Simple enough. Iron and sulfur are what we see here on earth with a bit of water that allows for life. The purple sulfur bacteria are part of a group of Proteobacteria capable of photosynthesis, collectively referred to as purple bacteria. As the pausible reason for why we are seeing methane on mars. At some point early on, Mars had a thicker atmosphere and oceans, much like early Earth. The scientists say life began as single-cell microbes very quickly on Earth, soon after stable ocean conditions developed at all. The disagree on exactly how and where, but that's not important. It happened. Assuming the same thing happened at the same conditions on Mars, then early Mars was also teeming with microbial life early on. The difference is that Mars lost its atmosphere and clement surface conditions long ago. However, given around a billion years, such microbial life should have colonized the land and the deep rocks, just like we have learned that it did here. Today, Mars lacks oceans, and its surface has become genuinely hostile to life as we know it here on Earth. That's not to say some Earth microbes couldn't survive there, but conditions are rather harsh for it to thrive. That leaves the deep rocks. On the assumption that life started very early on Mars when it had significant air and oceans, then it should still be thriving down under the surface. That would be microbes in the deep rocks, same as we have discovered here, in recent decades. Some of those produce methane here on Earth. Sooner or later, somebody will drill deep looking for something else on Mars, and find microbial life. Then we will finally find out whether it it is closely-enough related to us to cause problems, or not. We will then also find out we mistreated the two NASA scientists, who discovered (about 20 years ago) what they claimed was bacterial fossils inside the Allan Hills 84001 meteorite, thought to have been blasted from Mars. If we find things we recognise as microbes on Mars I will suspect a panspermian origin for both them and us. Why should Mars life take the same form as Earth life? I am going to see if I can make a post here, if I can find the materials I found earlier today. Or else I will delete this. I am looking at Venus, but of course, it is possible that there were at least 3 habitable worlds in the early solar, system, Mars and Venus included. So, yeah, maybe panspermia. This is rather early in the solar systems life, but the aftermath of the scattering of objects could have lived on for some time afterwards where scattered bodies may have still been trying to acquire a new harmony, and failing to the point of collisions deeper into time. And of course I have a suspicion that interstellar panspermia is quite possibly possible. In that case, all you need is a wet body and some chemicals to make a place for critters to live. Ferroplasma acidiphilum is an acidophilic, autotrophic, ferrous iron-oxidizing, cell wall-lacking, mesophilic member of the Ferroplasmaceae. F. acidophilum is a mesophile with a temperature optimum of approximately 35 °C, growing optimally at a pH of 1.7. F. acidophilum is generally found in acidic mine tailings, primarily those containing pyrite (FeS2). It is especially abundant in cases of severe acid mine drainage, where other organisms such as Acidithiobacillus and Leptospirillum lower the pH of the environment to the extent that F. acidophilum is allowed to flourish. F. acidophilum obtains energy by oxidation of the ferrous iron in pyrite using oxygen as a terminal electron acceptor. This process produces sulfuric acid as a by-product, leading to further acidification of its environment. Its type strain is YT. Not quite what I want, but interesting, Venus now has an acid environment, and Mars apparently had a wet acid environment towards the end of it's presumed habitable era. So, useful. I Won't clutter things with these quotes. One thing I did discover about some of the acid lovers is that they would like to eat metals such as iron, in some variations. So, then I wondered about dust in the Venus atmosphere. I am not aware of good information on that subject. I do know that about ~1/2 of the Venus surface is involved with supercritical CO2, and that the winds even if slow, will be like ocean currents due to the density of the atmosphere. So, I speculate without proof at this time that the surface and/or volcano's can generate dust with metals which could get involved in the cloud deck. Again, read for yourself, I will spare the quotes. Somewhat old, suggesting that life even now if it existed on Venus could be blown to Earth under certain situations. Probably disputed, I would presume. Anyway Aluminum 26 in our small accreted objects are presumed to have made them into mud balls for millions of years in the early formation of the solar system. The asteroids would then either become something on the order of dwarf planets, or maybe even comets later. So, trying to condense my post, I speculate that when the gas giants may have migrated, they would have bombarded quite a few planets by perturbing the orbits of such dwarf planets and lesser objects, and the result could have been Hot springs, even acid hot springs on Mars for some time, and also eventually acid clouds on Venus. If we believe that the Moon formed by an impact of a Mars sized object to Earth, then I presume that a possibility could exist that Mars and Venus were alive, and Earth was scorched. But later when Venus and Mars, were deteriorating, perhaps life came to Earth from one or both of them. And it is in my mind possible that it's origins could be interstellar. I forgot to include this in the previous post #15. So, if true I would speculate on two possibilities of how (There could be others). 1) Birds somehow spread the bacteria so that they can interact globally. Perhaps involving their digestive tracts and feeding and drinking behaviors. 2) Some bacteria can levitate into the atmosphere themselves, or their spores? I am thinking of electrical levitation. Sometimes spiders do it, and they are much larger than bacteria, microbes, or spores. If this were possible then it could explain how swarms of bacterial sized particles can hang out in the clouds of Venus. Presuming that they are alive microbes, and can levitate, and also tolerate/prosper in all the other conditions they would be subjected to. Acid for one. U.V. for another. Nutrients??? My home water is pumped from a drilled well with a depth of 280 ft; its heavy with iron and other minerals plus the hydrgen sulfide as well to which while its not salty there is a greenish algea that will grow in it on various surfaces where the wter comes in contact and I am sure there is bacterium as well since our septic has not needed the usual pumping to keep it clean. That said if life did get started and went under ground as to follow where the water went as it receeded and the suns energy became to harsh for it to withstand. Caves would be just one of those places to look into as it would give a guard against the changes. Maybe going one step further is desalination of the brine water on Mars to a desired salinity. The extra salt can be an industrial feedstock Bleach? A question though, can salt -- say calcium chloride or perchlorate and water or oxygen --- be split into calcium oxide and chlorine, readily and economically with current technology? We already do that with sodium chloride on a very large scale, so yes. Yes, if aquifers could be accessed, then water, metals, and exploration if life exists on Mars. so theses bacterial capture of brine can be combined with processes in construction industry. Ethylene is generated by fixing carbon dioxide with hydrogen. Bacterial capture of calcium chloride, ethylene and water or an oxygen carrying chemical agent are converted to calcium oxide and vinyl chloride with some hydrogen chloride. Vinyl chloride is polymerized to PVC which is used for pipes. The calcium oxide and the silicate minerals on Mars generate the cement. With other minerals and the steel produced on Mars, reinforced concrete and PVC pipes are then available for building. Void I believe we have a smoking gun for mars life in the seasonal out gassing of methane. Researchers confirmed the most likely source of Mars' methane, considered a sign of life, to be an ice sheet east of Gale Crater. According to computer simulations, up to 4,000 tonnes of methane in total may have been released from a region less than 800 kilometres east of Gale Crater. I also ran across that today. I have to say that I am warming up to the ~Equator of Mars I like sandstone as I believe that we could most easily burrow into it for bulk pressurized spaces, and then to have such a Methane deposit not that far away proposed to exist. And possibly if drilling in places such as sandstone brine might be accessed. Still a lot of if's, but in the long run if true, worth a look. Better than ice slabs in high latitudes, I think. If you find no brine aquifers, and yet you have Methane, you then of course have a source of rocket fuel, and water. Just bust some Oxygen out of the Martian atmosphere, and then you can create water with the Methane. And of course I think a quick answer about life being present. It seems to me it is rather unlikely that Methane would build up without brine being present. So, I am thinking ~Equator. Rather hope SpaceX is flexible in their thinking. Never was in love with the Shackleton near death march at high latitudes for water ice. Rather have palm trees Well maybe in caves in sandstone.